Posted September 27, 2017 by Reed & Associates & filed under Press Releases. They say it takes a village to raise a child. That’s never truer than for families raising a sick one. 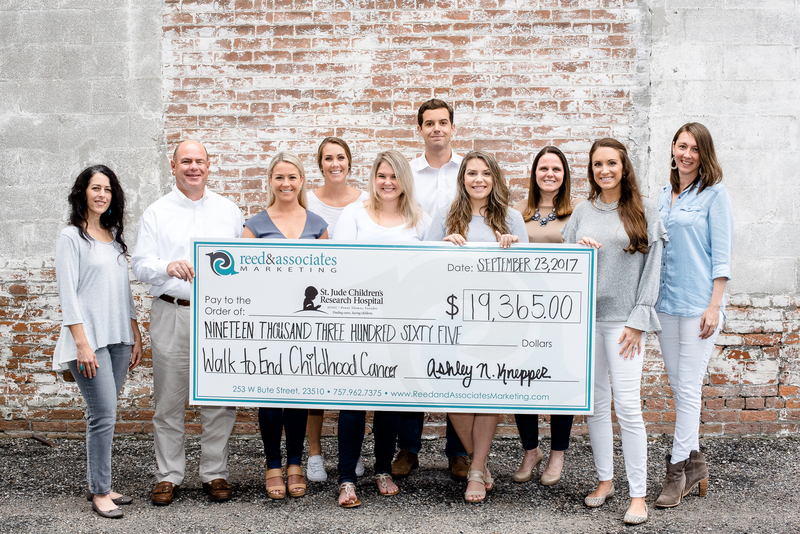 At least, that’s the mentality of Reed & Associates Marketing (R&A), Norfolk-based national marketing agency, when it comes to fundraising for St. Jude Children’s Research Hospital® in its annual Walk/Run to End Childhood Cancer. From tapping into its vast network of family and friends to partnerships with local businesses, the company feels that community outreach is paramount in sharing the hospital’s mission. St. Jude is leading the way in the discovery of treatments to defeat childhood cancer and other life-threatening diseases. Thanks to improved therapies, more than 80 percent of U.S. children with cancer have become long-term survivors. And an estimated 420,000 childhood cancer survivors live in the U.S. alone, with many more around the world. Showcasing that one network striving to make a difference has the potential to impact others on a global scale. Each year R&A takes its fundraising efforts to new heights. In addition to tapping into personal networks, the agency leverages relationships with business owners in Hampton Roads. This year, Knepper secured donations from organizations such as The Lawson Companies and 80/20 Burger Bar contributing seven percent of the funds raised. Last Saturday, members of the agency joined hundreds of supporters at Norfolk Botanical Gardens for the walk. The team’s 13 members raised over $19,000 to support the hospital’s mission with help from 113 contributors. This was the organization’s eighth year participating and fifth year as Hampton Roads no. 1 fundraiser, ultimately totaling $85,000 in funds raised and donated by R&A since 2010. For more information about St. Jude and other philanthropies R&A supports, visit http://bit.ly/RAGivesBack.